Did you know that the earth is always moving? Even as you read this, the ground under your feet is shifting very, very slowly. Because it happens so slowly, you don't feel it. But sometimes the earth moves very quickly. When this happens, you feel it! 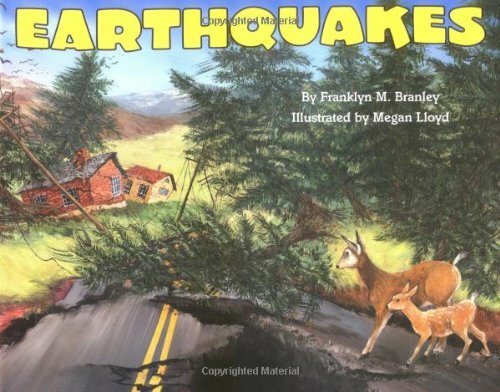 The ground shakes, things fall from shelves, and cracks appear in sidewalks -- that's an earthquake. This simple introduction to earthquakes explores what causes them, how they are measured, and what to do when you are in one. Read and find out all about one of nature's most mysterious and powerful natural forces in this brightly illustrated book. Franklyn M. Branley was Astronomer Emeritus and Chairman of the American Museum-Hayden Planetarium. In 1960 he originated the Let's-Read-and-Find-Out Science series, dedicated to explaining science to young children and encouraging them to explore their world. Dr. Branley wrote over 150 science books for children.